A recent study (by Tom Anderson) makes the claim that the Bible is as violent as the Koran. Hence there is no need to worry about with Islam. It is just like Christianity and Judaism. My only interest is in political violence, not when Cain killed Able. Political violence is when a group attack those outsides of it. It is political when Muslims kill Kafirs in jihad, for instance. This eliminates counting personal violence and internal wars. 🔑 We want to measure ideas, so we count more than individual sentences. 🔑 We need to count all the content that applies to ‘the political’ violence. The violence in Islam is prescriptively applicable to all people and times. Jihad is forever. This data makes sense. 2019 It will be jihadists committing murder in the morning news, not Methodists or Mennonites. 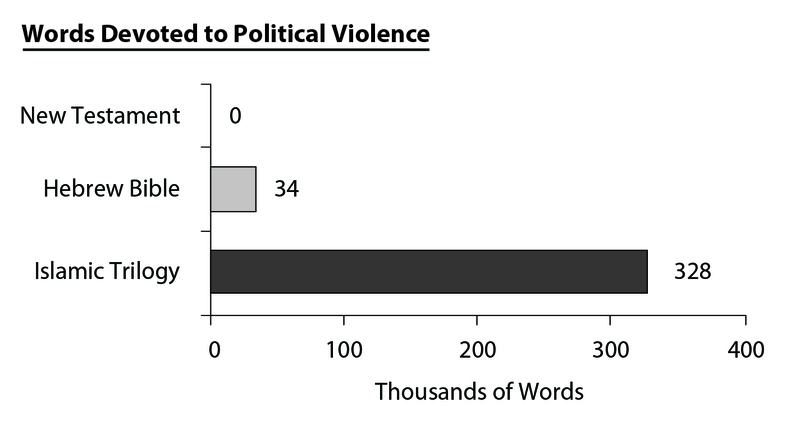 In short, there are nearly 10 times as much political violence in Islamic doctrine that there is in the Bible.